It’s no secret that buying and selling real estate is one of the most popular investment vehicles among entrepreneurs. Coupled with flexibility and passive income, real estate investment offers an unparalleled world of financial freedom and compensation that few industries can match. From rehabs and rentals, to short-sales and REO properties, there are a lot of paths to get started investing in real estate. In my last series, Breaking Down The Cost Of Real Estate Investments, I reviewed the costs associated with various real estate investing strategies. For those interested in taking the next step towards investing, we’ll break down the various options for getting started. In part one of our three part series, we’ll examine the building blocks to real estate investment: mindset and education. Making the leap from employee to real estate entrepreneur doesn’t happen overnight; it’s a gradual process that takes time, energy and the right mindset. In essence, the real estate entrepreneur mindset is comprised of two components: a persistent drive and a mentality to never cease learning. While there’s an abundance of opportunity in real estate, the right investments don’t simply fall in your lap; it takes hard work and most importantly, having the right perspective. Rise And Shine: Tapping into the power of mornings is essential when starting out in real estate because it can set the tone for the rest of the day. In fact, waking up early has also been proven to reduce distraction, improve willpower and even assist in feeling happier and healthier. Personally, I like to spend one hour each morning educating myself on a new subject, because it is the time when I can absorb the most knowledge. Talk To Yourself: Typically referred to as “self-talk”, talking to yourself is another common habit found among many entrepreneurs. The practice is used to build confidence by encouraging and applauding one’s self rather than demean it. As a beginner investor, it’s important to talk to yourself like a champion, rather than listen as a victim. Get in the habit of using the pronoun “you” instead of “I” when speaking to yourself. A new study from the University of Illinois found doing so can boost willpower and help to motivate us when faced with obstacles in our lives. Visualize Success: Among successful entrepreneurs from all industries, the one commonality is that they started with a vision. The daily practice of visualizing success can have untold benefits on real estate entrepreneurs, including improving mood and clarity. To get started, beginner investors should create a vision board that relates to their financial and business goals using a collection of images and photos. Network Constantly: Eleanor Roosevelt famously said: “Great minds discuss ideas; average minds discuss events; small minds discuss people.” As a real estate investor, networking plays a critical role in one’s long-term success. The first step is to build a extensive real estate network of contacts — both in the office, and outside of it. To become a successful real estate entrepreneur, beginner investors most always be networking and on the lookout for new leads, friends and potential partners. Find Your Why: A major part of the real estate entrepreneurial mindset is uncovering your ‘why’ for getting started investing. Whether it’s flexibility, financial freedom or personal satisfaction, every entrepreneur has a reason for wanting to succeed. Like any endeavor, to maintain motivation investors need to be aware and remind themselves of their ‘why’ as this is what will eventually push them to overcome hardships and achieve their dreams. The right mindset is the first step to a successful career in real estate investing. Following these daily habits will get you on the right path towards achieving an entrepreneur’s mindset. As a real estate investor, it pays to be informed and up-to-date on developing trends and advancements in the market. The spirit of the entrepreneur mindset is based on a desire to acquire knowledge and use it as a fruitful asset, and the importance of real estate education shouldn’t be overlooked–especially for beginner investors. However, the real estate education journey never ends. There is a lot to know in real estate, whether it’s financing or investing — and success favors those most prepared. To get started, I advise beginner investors to join local investment club meetings, networking events and real estate investing education websites. These outlets can all serve an important purpose, whether as a source of information or contact down the road. When I first got started in real estate, I pulled every book and resource I could on the subject before I started my investing business. Even then, the biggest lessons I learned were through making my own mistakes, and learning from them. You can read all the books and blogs in the world, but nothing can replace the knowledge that comes from experience. When you feel you are ready to take the leap into starting your own business, I highly recommend finding a mentor, or investing in a coach who can help guide you through the process. In order to make up for your lack in experience, finding an experienced advisor who can help you with every move you make is crucial in this business. You can save years worth of financial mistakes in real estate by investing in one such coach or program. Succeeding in real estate investment requires a entrepreneur mindset that encompasses a never-ending passion for learning and taking risks, while leveraging that experience to conquer future endeavors. The fact is, success can only come from trial and error, but the more we learn and educate ourselves on those mistakes, the better prepared we’ll be for the next outcome. Than Merrill, founder of FortuneBuilders, is considered to be one of the nation’s most successful real estate investing moguls. 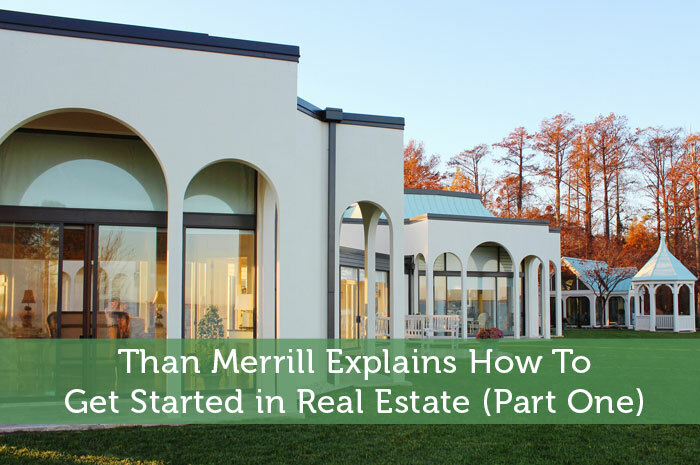 As a Yale graduate, former NFL player, and star of A&E’s “Flip This House”, Merrill attributes his success to coaching and education. Currently residing in San Diego, CA with his wife and son, Merrill continues to pursue his passion of inspiring his students and all those around him. Follow him on Twitter @ThanMerrill. Awesome article. Love the tip about waking up earlier. I really enjoy being a husband and father, but family time is separate from self improvement time so it’s almost essential to find time for myself so I can educate and improve. I’ve found that waking up earlier has been the answer because it gives me time to exercise, gather my thoughts and learn something new.